Since I was small, my grandparents would always make me French fries (I was very picky, and french fries were one of the 3 foods that I would only eat). I would always ask for an egg (sunny side up), so I could dip the fry in the “tocho” (our special word for egg yolk – I just googled it, and that word doesn’t exist – must be a northern thing). When I was French-fried out, I would use toast as a replacement. 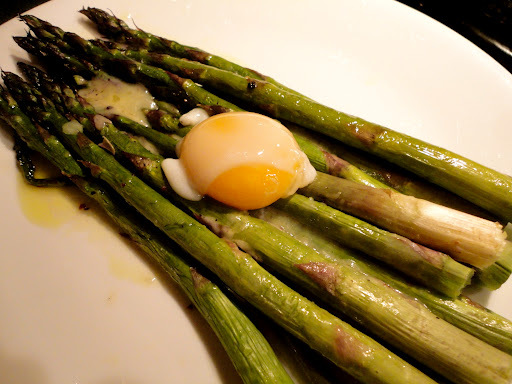 A few years ago, I saw this asparagus + egg combination at a restaurant and since I began a love for asparagus at the time, what could be better than tasting two things you love? In typical Alexsia-fashion, I wanted to try this at home… and it while it didn’t go quite the way I expected, it turned out pretty delicious. Preheat your oven to 350F. Cut the ends of your asparagus stalks, and place them on a cookie sheet covered with aluminum foil. Drizzle some evoo on them, and sprinkle some salt and pepper. Cook them for about 12 minutes in the oven. 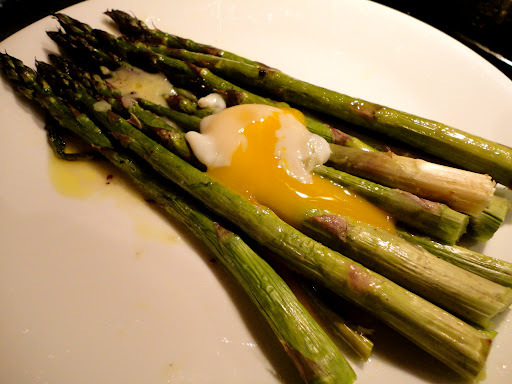 While the asparagus is cooking – cook an egg sunny side up! I tried to cook the egg in boiling water – as you can see the protein part of the egg (called albumin, fancy!) is all gone because it fell apart in the water (win). Clearly this is a culinary technique I have yet to master. The combination of yolk + old cheddar + asparagus tastes amazing! I hope you’ll love it. Are there any asparagus recipes that you love?